I will start by discussing the genre, “crime thriller”. There was definitely a lot of crime, particularly murder. In a movie that is about drug lords and brothels there is a distinct lack of drugs or prostitution for that matter. As for being a thriller, the murders were gruesome, does that count? Nicholas Winding Refn, as director, chose not to show any of the actual murders, cutting away for the crucial seconds before retuning to a bloody, opened up body. The scenes in the film are almost exclusively at night, with the lighting crew only having access to red filters. Red represents danger, we get it, but every scene…. Also overused is the long stare. There is minimal dialogue in this film, instead the cast stare at each other. They stare L O N G stares. Instead of films Refn could be directing American soap operas where the “stare” is the premier vehicle for conveying tension. Refn is also a fan of meaningful walks, preferably down long corridors. Police Lieutenant Chang enforces his moral code by murdering them usually with his sword. His sword that is seemingly invisible until it is required when is suddenly appears on his back. Carrying a deadly sharp sword on his back might explain why he walks so slowly without any discernable arm movement. Coupling Chang’s slow walks with a long corridor makes many scenes painfully drawn out. In a movie such as this, viewers are meant to suspend disbelief. This is difficult. Shot in Bangkok Thailand Refn forgot one important visual requirement. People. Bangkok is crowded everywhere all of the time. Not in this film. Except for the scene in the café there are never any crowds anywhere. In short this is a gangland war between gangs, one person gets murdered which results in a revenge murder, which leads to a revenge murder, followed by a retaliation murder, which means… you get the picture. For a reason that is never fully explained Chang after a successful kill likes to sing tuneless karaoke (like there is any other kind) to the lower ranked members of his police force. One thing I did learn is to not decorate a karaoke lounge with vases of flowers and bowls of fruit where the contents of each are all held in place by a series of long ice pick styled daggers. When the cities police lieutenant is known as the “Angel of Vengeance” this is only going to lead to all manner of trouble. 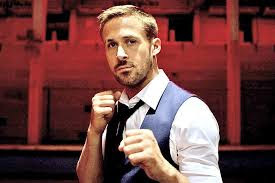 Did I mention Ryan Gosling is in this film? He is! In fact he is the lead character, in theory. It could have been anyone, as his character does not really do anything. He is meant to be a respected figure in the underworld and head of a leading kickboxing gym. In the picture above, does he look like he can box?? I cant remember his character’s name, it was not and it not important. Kristin Scott Thomas deserves a mention. The harsh and brutal callousness of her role added a point of interest. She delivered a lot in a film that delivered so little.